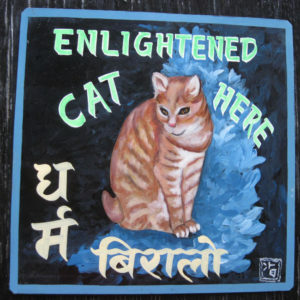 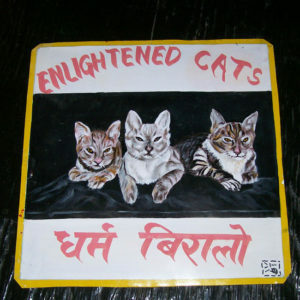 Folk art Tabby Cats hand painted on metal by sign painters in Nepal. 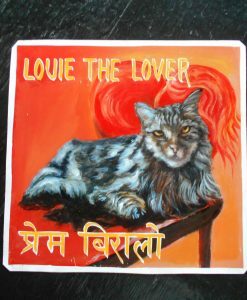 Sagar Bitsa hand painted the Grey Korat Cat Valentino and his Muse the Tabby Cat on metal in Kathmandu. 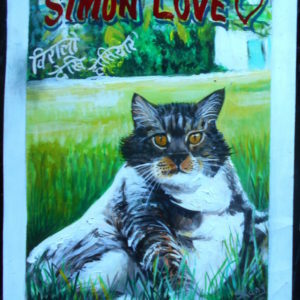 Using synthetic enamel this could be hung indoors or out. 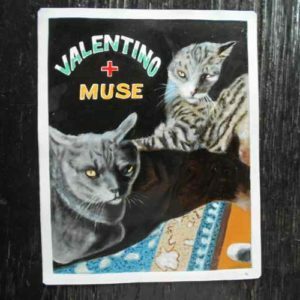 Sanjib Rana hand painted this Matisse like portrait of Valentino and Muse on metal using acrylic paint. 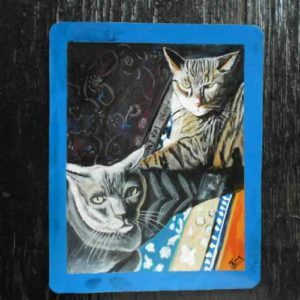 Valentino is a Grey Korat Cat and his Muse is a Tabby Cat. 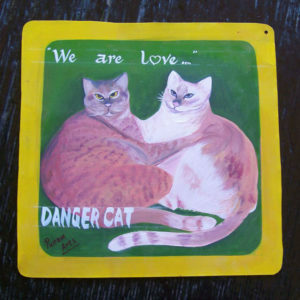 This portrait is a little larger than the usual Danger Dog sign at 12″x15″. 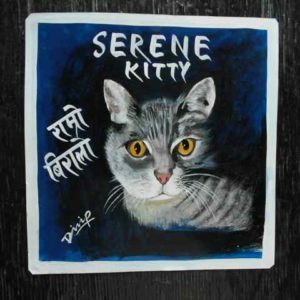 Dilip Niroj hand painted this Serene Kitty in Kathmandu. 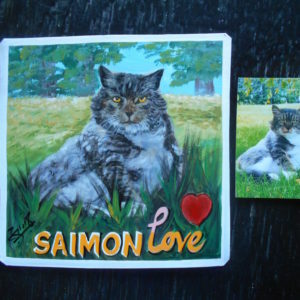 This tabby cat is available at the Craft & Folk Art Museum. 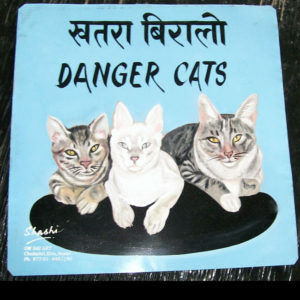 Contact cafam.org to purchase. 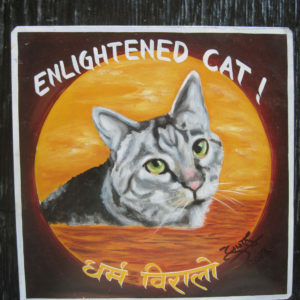 Mary is hand painted by Sagar. 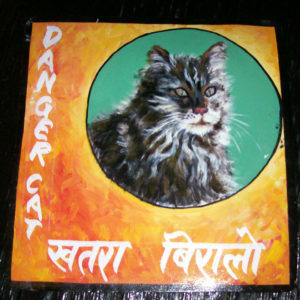 Sanjib Rana hand painted this portrait of Mina on metal. 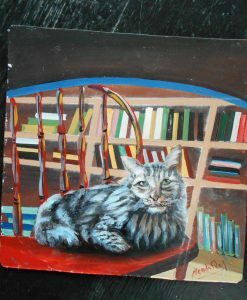 Whiskers is an adored Tabby who has her own FaceBook page, and now a hand painted portrait by Baba. 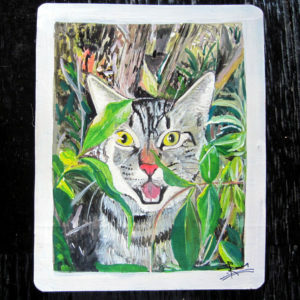 This was a difficult photo to work with as Whiskers was looking out from a jungle of leaves. 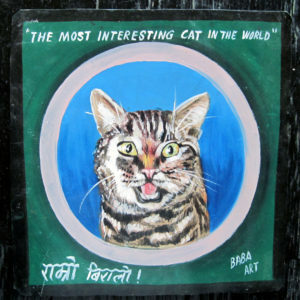 Sanjib Rana painted this portrait of Whiskers, ‘The most interesting cat in the world’. 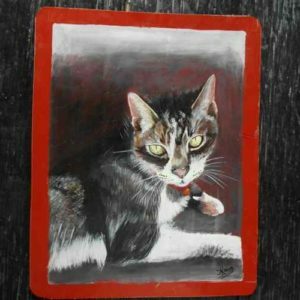 As this lovely tabby peeks out from the shrubs, her beautiful coral nose, pink tongue and bright golden eyes are a striking contrast to the brilliant greenery that surrounds her.